The Arterial Network's African Creative Economies Conference taking place in Morocco from November 13 - 15th will see hundreds of leaders, activists, artists and representatives of civil society and African governments converge to share their success stories with the intention to address the need for pragmatic solutions in their fields. Acknowledging the value of freedom of creative expression, an additional thematic focus of the 2014 edition will further define the link between arts, culture and democracy. Conference speakers include African Ministers of Culture and various cabinet representatives, thought leaders from the African Union and UNESCO, a wide variety of cultural entrepreneurs such as Joy Mboya of the GoDown Center (Kenya) and Touria el Glaoui, Founder of the 1:54 Contemporary African Art Fair (Morocco), and African innovators such as singer Didier Awadi, fashion designer Alphadi and photographer Aida Muluneh. 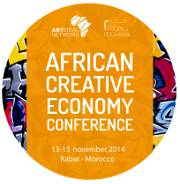 ARTERIAL NETWORK'S 4TH AFRICAN CREATIVE ECONOMY CONFERENCE (RABAT 13-15 NOVEMBER 2014) PROGRAMME AND SPEAKERS SNNOUNCED FOR THE ACEC2014! With Arterial Network's 4th African Creative Economy Conference (ACEC2014) taking place in less than three weeks, more details of the conference programme and speakers have been announced! Rabat, Morocco, from 13 to 15 November 2014.
their success stories with the intention to address the need for pragmatic solutions in their fields. edition will further define the link between arts, culture and democracy. Alphadi and photographer Aida Muluneh.